Muhammad Ali, born on January 17, 1942, was an American professional boxer and a philanthropist. He was born in Louisville, Kentucky. He is still globally considered as one of the greatest and inspiring boxers of all time. Muhammad Ali was named Cassius Marcellus Clay Jr on his birth under his father’s name (Cassius Marcellus Clay Sr). 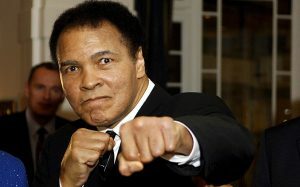 He changed his name later in March 6, 1946 to Muhammed Ali. Cassius Clay Jr grew up in South America with his parents and a brother. His father supported his family by painting signs and billboards and his mother used to work as a household domestic. At the age of 12, Clay Jr started his training under the instructions of Joe Martin, who was a Louisville policeman. 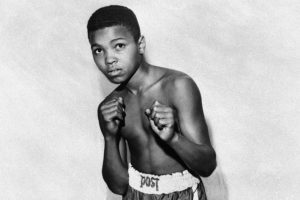 Cassius Clay Jr trained hard and after advancing through the amateur ranks, he claimed his first gold medal in Rome at the Summer Olympic games in 1960. After winning the medal, a Louisville sponsoring group consisting of 11 wealthy men helped Clay Jr begin his professional career. Clay Jr was known more for his fascinating behaviour and rather than his skills in the ring. As a professional boxer, Clay won his first boxing debut in a six-round on October 29, 1960. He earned the nickname “Louisville Lip” because of the combination of his robust jabs, foot speed and his boastful behaviour. Cassius Clay challenged Sonny Liston, who was universally regarded as the terrifying and powerful fighter of his time, for the Heavyweight championship. Sonny Liston accepted the fight and the whole world witnessed the most stunning match in sports history. Liston gave up after six-rounds and Cassius Clay Jr became the new Heavyweight champion. After he was crowned the champion, Clay Jr roared in the ring that he is the greatest. Just two days after he became the champion, Cassius announced that he had accepted the religion Islam and changed his name to Muhammad Ali, given by an Islamic leader Elijah Muhammad. After that Muhammad Ali dominated boxing for the next three years as an aggressive and a magnificent fighter. On May 25, 1965, there was a rematch of Muhammed Ali and Sonny Liston. 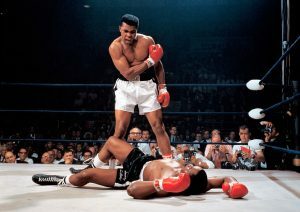 Muhammad Ali again won over Liston with a first-round knockout victory. In 1967, Muhammad Ali was showed up for serving the U.S forces against Vietnam War but he refused to serve them because of his religious beliefs. After refusing, he was arrested and his boxing license was suspended. Moreover, the New York State Athletic Commission also abrogated his Heavyweight championship belt. Muhammad Ali was sentenced to prison for five years and was also fined 10000 dollars. After that his popularity among the people plunged down. But Muhammad Ali was since his conviction was not appealed so he delivered speeches in college campuses against the Vietnam War. After three years, the Supreme Court reinstated his boxing license and turned over his sentence in a concordant decision. Returning to the ring after 43 months, Muhammad Ali knocked out his first opponent on 26 October,1970, Jerry Quarry in the third round. After that, on 8 March, 1971, Muhammad Ali battled against the current Heavyweight champion Joe Frazier. He was defeated in the final round as Frazier knocked him down with a brutal left hook. It was the first defeat for Muhammad Ali as a professional boxer. After his first defeat, Ali kept on defeating Opponents in the upcoming years. On 31 March, 1973, Muhammad Ali faced Ken Norton in the ring. Muhammad Ali’s jaw was broken by Ken in the second round and he again suffered defeat but he defeated Norton in a rematch. Later on, Muhammad Ali fought with Joe Frazier and defeated him in the 12th round. It was the best performance from the inspirational boxer since his exile from boxing. After that he got a chance of his Heavyweight title against George Foreman and knocked him out in the eighth round to regain his title back. Since then, Ali kept on winning fights and defended his Heavyweight Championship 10 times including a fight with Joe Frazier which Ali won in the final round after his eyes got swollen. As the boxer was aging, he lost his title to Leon Spinks on 15 February, 1978. But after seven months he again defeated him and won the title. In 1979, Muhammad Ali announced his retirement from boxing but came back after some time. After that, he lost two fights against Larry Holmes and Trevor Berbick in 1980 and 1981 respectively. After these fights he retired from boxing with a record of 37 knockouts, five losses and 56 wins. Later on in 1990, the International Boxing Hall of Fame introduced Muhammad Ali and was also named “Fighter of the Year” 5 times by the Ring Journal. Moreover, he was awarded the Presidential Medal of Freedom in 2005. Muhammad Ali was married four times in his entire life and has 2 sons and 7 daughters. He died at the age of 74 on 3 June, 2016 in Arizona.